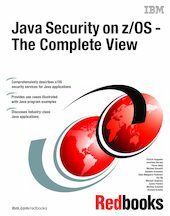 This IBM Redbooks publication describes and explains which z/OS security services can be exploited by Java stand-alone applications executing on z/OS. It is intended for experienced z/OS users with a moderate knowledge of Java, and experienced Java users with some knowledge of z/OS. For experimentation and customization it provides use cases that were composed and tested on a z/OS platform at z/OS V1R10 and SDK 6 SR1. The book describes the role of the major infrastructure components such as Security Manager, Access Controller, Class Loader and Byte Code Verifier. It addresses specific z/OS-provided facilities including the JZOS Toolkit and Java record I/O (JRIO), and explains how they fit within both security models. Java Authentication and Authorization Services (JAAS) is covered and practical examples illustrating its use in z/OS, including the LoginModules that interact with the SAF interface, are given. The relationship of these services to z/OS built-in security functions such as APF, Program Control, and so on is explained. The specific security-relevant services provided to Java applications executing on the z/OS platform are covered, along with practical examples of their setup and use. Java SAF classes, the JSec API, exploitation of RACF PassTickets, and the use of the z/OS Enterprise Identity Mapping (EIM) infrastructure are explained. Exploitation of z/OS integrated hardware cryptography by Java applications is detailed, along with numerous practical examples of the use of these services. z/OS cryptographic key management features are also discussed. Finally, the book addresses two industry-class IBM Java products that exploit z/OS hardware cryptography, IBM Encryption Key Manager and IBM Encryption Facility for z/OS OpenPGP Support, and highlights the exploited functionalities and performance optimization.